Wine Ch Haut Bailly La Parde de Haut Bailly 2011 - Royal Wine Merchants - Happy to Offer! ust a stone’s throw away from the city of Bordeaux, Château Haut-Bailly, one of the most prestigious Cru Classé de Graves, sits majestically in a 30 hectare (74 acres) vineyard at the heart of the Graves region on the left bank of the river Garonne. 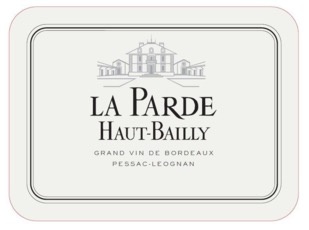 La Parde is the 2nd wine of Chateau Haut Bailly. Produced from the same plots as Château Haut-Bailly and made in the exact same way, La Parde Haut-Bailly is the result of a rigorous selection. The blend is made of lots marked with freshness and fruit, backboned with a suave, elegant structure. Reflecting the virtues of the grand vin, La Parde can be enjoyed young, although it also has fine aging potential.